We are sure that you will enjoy dancing in this atmospheric hall with daylight, parquet and a professional sound system will ensure that the music goes right from your ears into your feet. For your comfort, there will be seats for everybody and the dance floor is accessible from all sides. 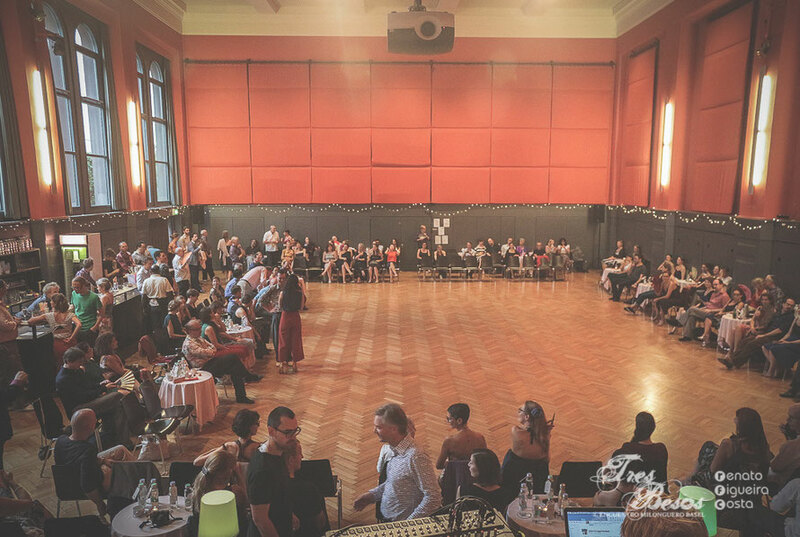 No separate seating of gender will apply, as we also believe in the social aspect of a Milonga where you can have a chat with your neighbor, regardless of gender. The exact address is Klybeckstrasse 95, 4057 Basel. The entrance is at the right side of the Restaurant Union. Tram no. 8 stops at the station "Bläsiring", just in front of the house. A supermarket and many little shops and restaurants for all your needs are close by. It is a short trip from both the airport as well as from the railway station by public transport. If you have a hotel reservation, the ticket for public transport is usually included in the rate of the hotel. If you prefer to take a Taxi, the trip from the airport will cost you about CHF 30-40 to the venue, or CHF 15-20 from the train station. It is safe to take a taxi from the waiting line. You can also order a taxi by phone at 0041 61 444 44 44 or 0041 61 333 33 33. If you are flying in via Euroairport Basel, make sure you take the Swiss exit (there is also a French exit) and take the bus no. 50 direction "Basel Bahnhof SBB" until "Kannenfeldplatz", change to tram no. 1 (direction "Dreirosenbrücke") and hop off at "Dreirosenbrücke" the venue is located just about 200 meters towards the city center to your right side, parallel to the river Rhine. The ticket must be bought in advance (2 zones). If you arrive at the Swiss railway station (coming from Zurich airport for example which takes about 1'10 h), take tram no. 8 (direction "Weil am Rhein") and hop off at "Bläsiring", just in front of the location. The ticket must be bought in advance (1 zone). If you are coming from Germany by train arriving at Badischer Bahnhof, use bus no. 30 (direction "Bahnhof SBB") and hop off at "Feldbergstrasse" it's a short walk to the location or you take tram no. 8 (direction "Weil am Rhein") and go 1 stop until "Bläsiring". The ticket must be bought in advance (1 zone). If you come via the motorway from Germany or France, try to avoid passing the border on the motorway because otherwise you will be urged to buy a Vignette (maut/road charge) for CHF 40. Instead, take the last exit "Weil am Rhein" or "Saint-Louis" before you enter Switzerland and drive on local streets. Parking your car in the area around the location is not easy. Due to the traditional autumn fair in town, it will be even harder to find parking space. To park your car in the blue zone on the streets, you must buy a ticket (half day CHF 6, full day CHF 10) at any tram ticket machine. Parking from 19:00 - 08:00 and on Sunday is free of charge in the blue zone. The closest parking is Parkhaus Claramatte (800m from the venue). Another option is the big parking at Messe and then jump into tram no. 14 (direction "Dreirosenbrücke") and hop off at station "Dreirosenbrücke".